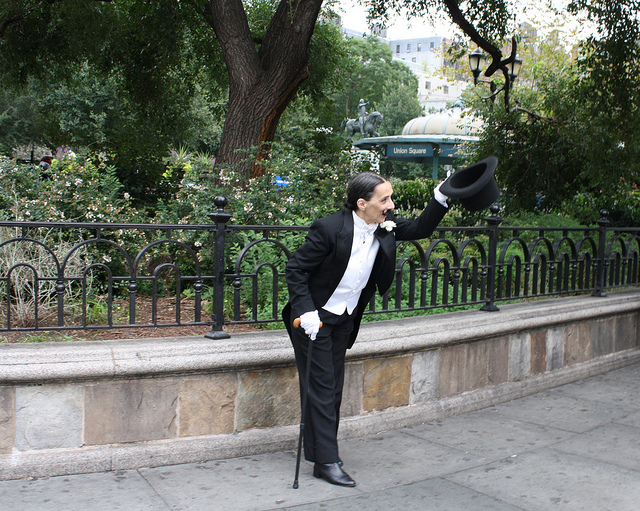 To bring a little chivalry and a touch of style back to New York, Lulu Lolo has taken to the streets as “The Gentleman of 14th Street,” tipping her hat and wishing a good day to passersby. 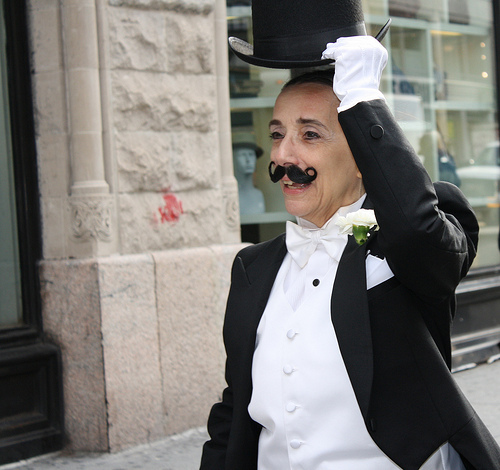 Donned in a black suit and top hat, handle bar mustache, stark white gloves and cane, Lolo strolled up and down 14th Street yesterday morning, between Broadway and 7th avenues, bidding people a good morning and tipping her hat as a gesture of civility. “Good morning to you,” Lolo, 50, from East Harlem, would call out in a jaunty, manly tone while tipping her hat. 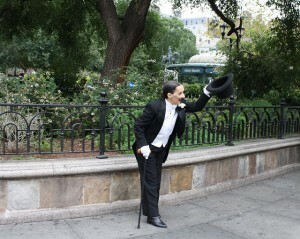 Lulu Lolo also known as The Gentleman of 14th Street,” tips her hat and wishes a good day to passersbys on 14th street. Photo by Nicole Guzzardi..
Lolo’s performance, “A Tip of the Hat,” is part of Art in Odd Places 2011: Ritual , which includes a variety of performances, theatrical presentations, public installations and art pieces. AiOP 2011 focuses on rituals, established actions that are carried out in private or public places, according to AiOP’s website. The artists incorporate ritual practice in their pieces to explore topics from politics and culture, to individuality and community. AiOP runs till Oct. 10, with over 60 artists performing and displaying work at different places and times each day all along the east-west corridor of 14th Street. For Lolo, it’s about the human connection. She hoped to connect with the people on 14th Street through this ritual gesture. She said it makes people stop rushing around and stop for a moment to say hello. Lolo’s inspiration came from an old Italian neighbor who would stop and tip his hat to her. “It’s such an old, courtly gesture that men used to do,” she said. People’s reactions to the gesture have been surprisingly positive, Lolo said. “I don’t know what I expected, but people are really touched by it,” she said. Artist Lois Weaver has a spin on rituals with a feminist undertone which she calls “Commit an Act of Domestic Terrorism,” She hangs laundry on 14th Street from Avenue C to 10th Avenue, from clothes lines she puts up in public places like trees and street signs. Lois Weaver hangs laundry on 14th Street between 2nd and 3rd avenues, as part of the Art in Odd Places festival. Weaver, 62, from the East Village, has been intrigued with laundry and the process of hanging it ever since she was young and her mother taught her. She believes the hanging laundry is a thing of beauty. Weaver performed a piece in the past in which she discussed the way her mother taught her how to do and hang laundry. Women often related, telling her their mothers’ taught them too. Maria Rosado, 64, from Park Slope, Brooklyn, walked by Wednesday morning as Weaver was hanging laundry on 14th Street between 2nd and 3rd avenues.